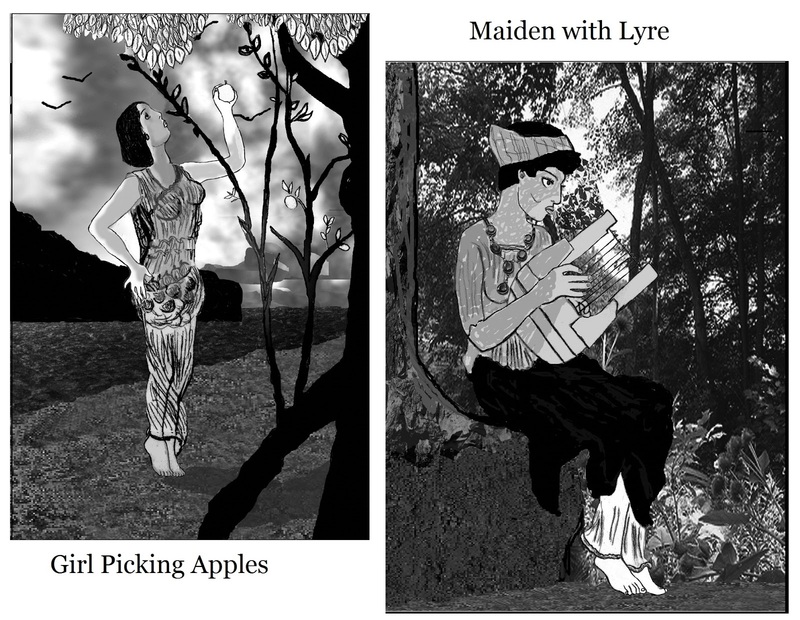 Check out the Art Lounge for a peak at our Featured Artist Ray Johnson's, work! 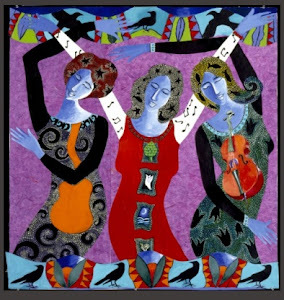 The Art Lounge is a showcase for Artists, with relevant articles and observations, but you can go straight to the Mini-Exhibit of this Artist's work. Washington Square Park, New York City is known for its vast array of live entertainment, from Sketch Artists, to Break Dancers, and all manner of visual and audio stimuli in between. Tourists, students and park regulars can expect to be titillated and amused every 40 or 50 steps. On any given day, you’ll likely find Stand-up Comedians and Musicians fighting for the attention of Park patrons. As you might imagine, not all performers are good, although most of them are. Among the entertainers competing for tips, you may occasionally come across the remarkably skilled “Human Statues”. These performance artists are spray-painted Silver or Bronze to resemble statues. I’m guessing these off-duty actors are looking to earn money between acting gigs. Whatever the case, I'm always amazed at how long they can stay completely still, - seemingly without breathing. This part-time job demands an extremely high level of concentration, considering that amused viewers are laughing and giggling. While some sadistic on-lookers go out of their way to break their concentration. As with all street performers, Human Statues look for a high concentration of pedestrian traffic, to enhance their earning potential. It seems like an easy gig, but I can guarantee you, it is not. This photo marks the first time I’ve seen a Statue performer engaged in normal activity! 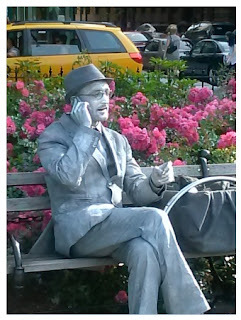 As this silvery man passed by it gave me a child-like feeling. 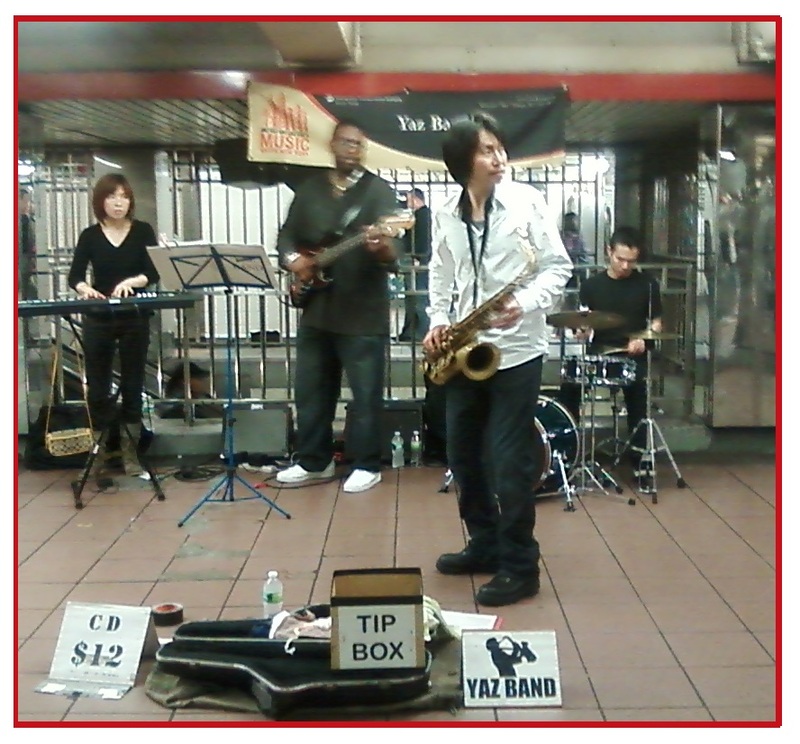 Totally amused, I gazed as the performer walked casually to the benches to take his break and make a phone call. Hmmm, I thought, perhaps he was checking in with his agent in hopes of good news about a big movie role. Realizing the image of stark contrast between the sitting Statue and his colorful surroundings sparked a powerful desire to capture the “Art” in the making. A recent trip to Paris has rocked my whole belief system about the New York being the Center of the Universe for Art, Culture and Cultural diversity. The energized city was so similar to walking the streets of the West village or Tribeca – only without the edge. Like strong coffee without the bitterness. Block after block of ancient buildings with wrought iron balconies and coble-stone streets gave me a unique feeling of oneness with art and history. I imagine for any artist or photographer, it is a deeper, more powerful connection. Like much of New York, Paris is a very walkable city. My daughter and I put in a few miles just taking in residential areas tucked away from tourists and tour buses. An official tour of the city (sans the main attractions) left me breathless. I can’t even articulate the sense of awe I experienced once we actually took a tour of the main attractions. Let’s face it, we’ve all seen pictures of the streets of Paris, and the City’s historic structures and churches in books, magazines and movies - but nothing can compare to seeing Paris live. After a few days, my daughter and I decided to take in a tour of the main attractions rather than struggle with their underground Metro system. As the tour bus drove under a narrow archway (seemingly too small for the double decker bus), we were all gasping as we passed through the other side. It was the Louvre Museum. Quite possibly the most famous Museum in the world, yet none of us were prepared for what we saw. 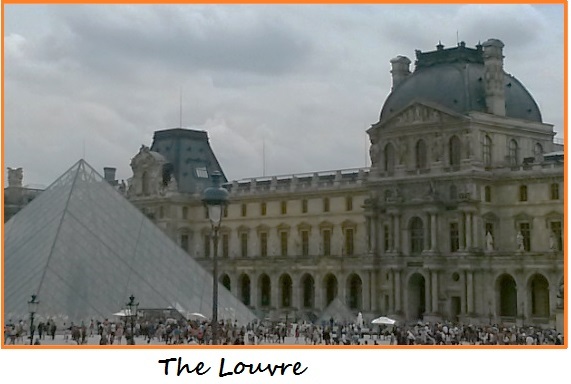 For anyone who is planning on visiting the Louvre someday, I will not ruin it for you. I will only say, I am forever changed after witnessing the Louvre, Notre Dame, and other amazing architecture in the City of Paris. Wherefore Art Thou, Sophia ! The power of love's chemistry on the human heart is immeasurable. I’m sure you have experienced “fire and desire” that brought you to your knees, at least once. Personally, I plead the 5th. I happened to catch glimpse of this note posted on a column of a staircase in the subway. As I was about to dash down the staircase, this image struck me - chiefly because it was hand written - which is unusual these days. I stopped to take a second look and saw the name Sophia on it. I had a clue what I was in for. This letter was posted in a dozen places around the city. 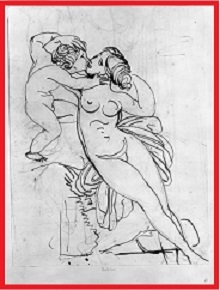 The love sick author poured his heart out to this "Sophia" and all of New York City. It's refreshing to see a note written by HAND, the old fashioned way - but it was starling, yet so moving to witness the raw, unabashed emotion of young love. It's been a long time since many of us have felt the spark of yearning that knows no boundaries. Unbridled passion and courage, an ingredient we seldom witness outside of a movie or television screen. This is the human heart's many realms that seem to recede as we mature, and experience the "reality" of life. Occasionally, we'll see a glimpse of this on a youtube video, staged to impress an intended recipient. In this case, I'm totally enthralled by this young man (Joe), since he could care less about impressing you or me, or even his beloved Sophia. He was somehow deeply touch by their meeting, and blinded by his desire to emotionally (and physically) connect with the beautiful girl he met in the subway. In the love letter, Joe indicates that there was strong chemistry as the two of them talked and flirted with each other. Sophia apparently asked this him to call her. I'm not trying to be Sherlock, but this is an important clue as to her level of interest. Unfortunately however, Joe lost his phone, thus could not follow through. Determined to broaden his reach, the hopeless romantic arranged to have an on-air interview on a local radio station and set up another interview with one of the TV News stations. In this letter Joe writes that he has received over 100 texts and phone calls from women who read his letter, but he is not in the least interested. Wow, he could have had a date every weekend for nearly two years on the residual interest, but he chooses to wait it out. 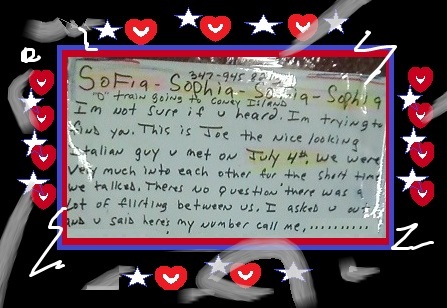 Shakespeare is no doubt smiling at this modern-day Romeo, as am I. I hope that Joe ultimately reconnected with Sophia. 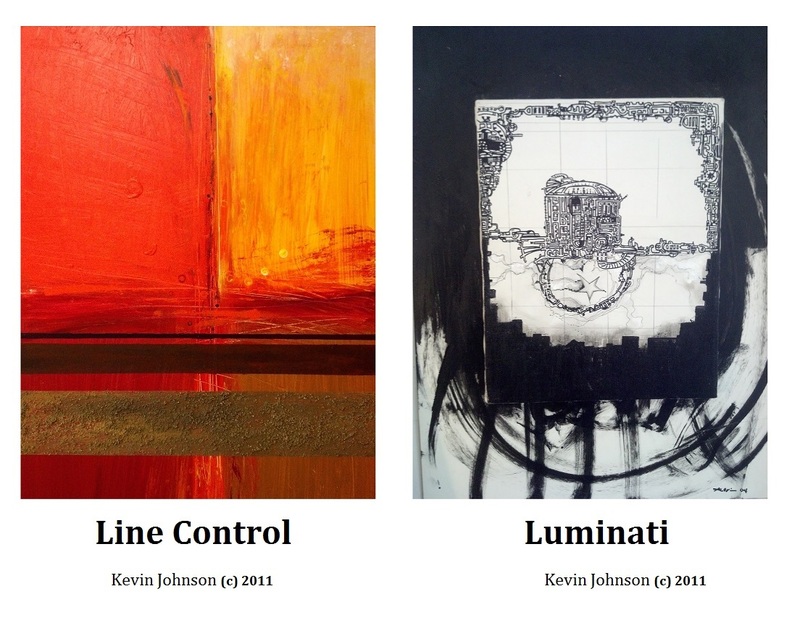 Check out the Art Lounge for a peak at our Featured Artist, Kevin Johnson's, work! The Art Lounge is a showcase for Artists, with relevant articles and observations, but you can go straight to the Mini-Exhibit of this Artist's work. I was minding my own business, heading to Wholefoods for freshly pressed kale and carrot juice, when my eyes caught a glimpse of the sparkling wonder. It was breathtakingly beautiful, and yet shamelessly gaudy. This sparkling instrument is a piece of history left behind by the late Liberace. 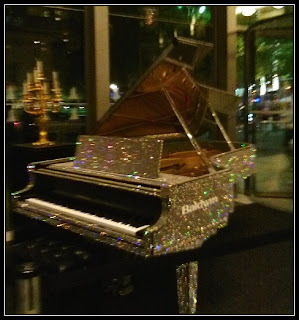 His bedazzled grand piano is quite luxurious looking in print, but an amazing spectacle to witness in person. It was on display at Columbus Circle in New York, as part of the "Behind The Candelabra" exhibition in the Time Warner Center. Liberace left a legacy of spectacular performances amid wildly extravagant spending and grandiose behavior. Underneath the glitter was a virtuoso pianist, who played as passionately and extravagantly as he lead his life. Scott Thorson, his ex-lover of many years has written a scandalous book about his life with Liberace (Published 1998). In it, he claims that he was taken advantage of. From the outside looking in, it appeared to be the classic May/December dichotomy (which is often dysfunctional)- but alas, who am I to judge. Whatever the case, Thorson was clearly out to get 15 more minutes of fame, if not revenge. A made-for-TV movie about his life aired last month, starring Michael Douglas and Matt Damon. I am sorry I missed it. I recently ran into an old band mate-club partner of mine. Tom and I met back in the early eighties in a funk rock band. We became fast friends and began to hang out during band down time, although most down time was spent chasing the members of the female persuasion. Tom had a home recording Set-up, and was doing some import-export of music instruments from Japan. Bought my first synth from Tom, a Roland Juno 60. His roughly 8X10 bed room was packed with recording and video Equipment. Stuff like the DX7, Linn drum, the now classic Roland 808, we recorded on the ¼” Fostex Reel to reel. 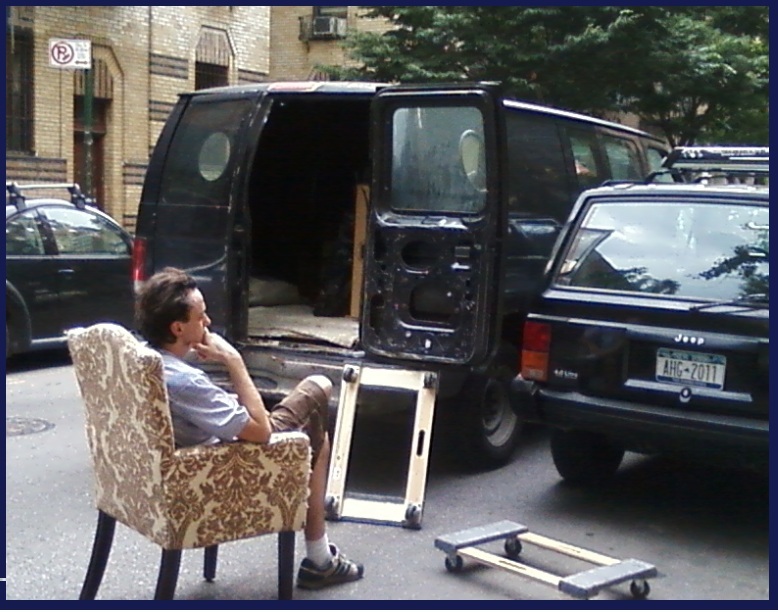 This was right before the explosion of the 4 track cassette decks. I remember those early Sequencers linked via a scuzzy connection, before midi and multi timbral revolutionized music production, which was in my view the game changer. You could for the first time in pop music history, write and produce a track from that faint bass line or vocal part that loops over and over in the back of your mind, to finished polished representation of that idea in minutes. Tom will always be linked to this time for me, as he seemed poised and ready for this transition. Living in any big city pushes habitants over the edge where manic and panic is concerned. New York is among the most crowded cities in the US, so, inner city dwellers have to establish turbo-style resources both internal and external to de-stress and recapture serenity. The ability to just "stop and smell the roses" is an important skill to develop. Coping with stress in our every day lives is challenge we must contend with, in the City or the Suburbs. We've heard it year, after year from Dr. Phil to Dr. Oz, but it isn't easy. Although we're urged to exercise, meditate, or find creative ways to express ourselves, it appears that food is what most Americans are flocking to instead. For many of us the simple practice of hitting the pause button to "chill" is not as easy as it should be. For this guy, pausing for a relaxing moment in time is evidently not a problem. Check out the Art Lounge for a peak at our Featured Artist, K.J. Reilly's, work! Advancements in Technology has had an immeasurable impact on the Global marketplace. In virtually every industry. The internet, in particular, has broken down many barriers to conducting business. The cost of importing and exporting goods and services has been drastically reduced, thereby extinguishing the competitive edge. These advancements have also shaken this up in the Arts world. You see, when it comes to the Music industry, labels and Image are much more valued than the music itself. So it’s not surprising when bonafide musicians, singers and composers are discouraged from jumping into the Music “Market”. Well, as it turns out, time and technology have finally leveled the playing field. The barriers and exclusivity of the Record Label are all but torn down – like the Wall in Berlin. Today, anyone wanting to express themselves through their Art can do so, without permission or executive approval. In this, the age of Youtube, Blogging and Social Networking, the stage is set for self expression and promotion. Yes, it's a little crowded, but the possibilities are limitless! 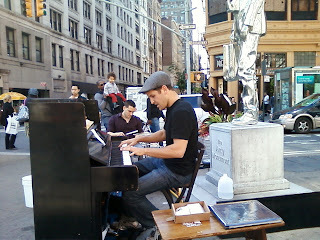 Imagine: In the Middle of the busiest intersection of New York City, there he sat playing his Upright Piano on wheels. To the delight of Tourists - likely shuffling to-and-from Macy's or Victoria's Secret. The sheer Audacity of this Musician to plant himself in the middle of Herald Square,where continuous crowds of people and cars pass through. This, my friends, is the very essence of doARTorDIE! The Music Lounge is Dedicated to Sharing Original Compositions and Songs by Founders, Kevin Johnson, Ray Johnson and Katherine Reilly. We will open the Forum to Subscribers who want to Share their material. As we develop Alliances with Publishers and Music Scouts for Movies and TV background Music, the Forum will undoubtedly foster opportunities for Artists.The Music Lounge will also post Videos, Pictures and Webcasts that capture Pop Culture. The Art Lounge isSharing Original Paintings, Scetches and Collages by Founders, Kevin Johnson, Ray Johnson and Katherine Reilly. We will open the Forum to Subscribers who want to Share their work. As we develop Alliances with Art Galleries and Curators, the Art Forum will foster opportunities for Artists. The Music Lounge will also post Videos, Pictures and Webcasts that capture a glimpse of Pop Culture. Come Look, Enjoy and Comment! Johnson & Reilly Arts Forum (c) 2013 - . Powered by Blogger.